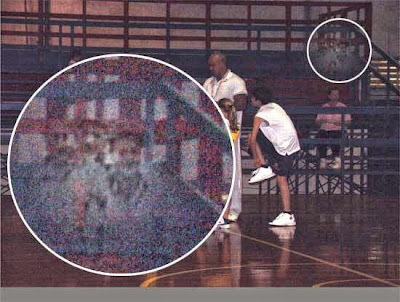 This photo was taken by the wife of the coach seen in the picture, inside the Ford Island gymnasium at Naval Station Pearl Harbor. Look carefully in the top right corner of the picture. There are three prominent ghost-like figures that appear in the photo. The photo was taken in the early evening with a digital point-and-shoot camera. Here's something interesting: The evening this photo was taken was also team "picture night". That's why the lady who took this had her camera with her. As well, a professional photographer was present and took lots of photos inside the gym that evening. There is no reason to doubt the integrity of the photo, especially with all of the stories over the years, and the history of that building and the island. A long-time employee on base told that building once also served as a huge pool hall, bar and dancefloor. A place where sailors wanted to congregate. As well, the ancient Hawaiians apparently used Ford Island as a ceremonial place. All of his sure adds to the allure of the photo.